A new pilot program at Evanston’s Piven Theatre Workshop welcomes kids of military families. Andrew Washington and Jnya Ikner join hands and spin at the center of Piven Theatre Workshop’s stage, chanting “hairdresser, dentist, chef, hairdresser…” until a signal from acting teacher Aayisha Humphrey halts them in imaginary “hairdresser” poses. One more signal from Humphrey and they’re in motion again, improvising a very-funny scene involving customers with ridiculous hair and even more ridiculous demands. The audience laughs and applauds. Watching, you’d think these kids had been acting for years. 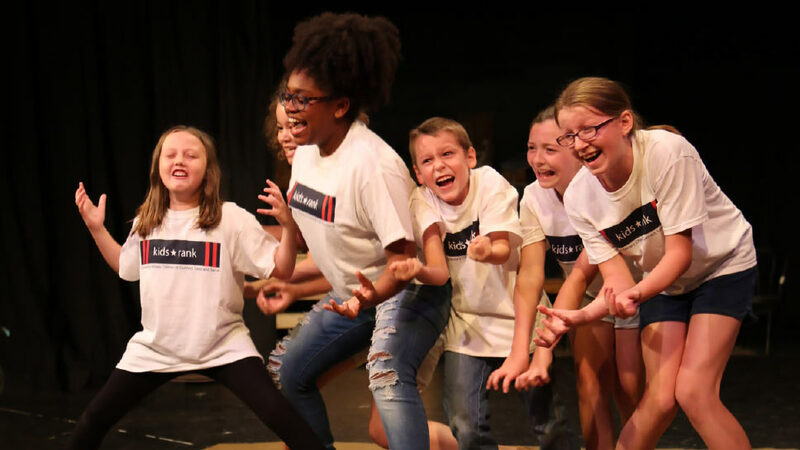 But in fact, both 11-year old Washington and 12-year-old Ikner are new to theater, as are the other 10 kids in Piven Theatre’s Evanston pilot program for veteran and military families. The show they are all putting on is the culmination of a weeklong theater workshop kicking off an ongoing collaboration between Piven, Citigroup, and Kids Rank—a Highland Park-based Veteran Sevice Organization (VSO) that provides the children of military families a sense of stability through group-learning experiences. Underwritten by Citigroup, the Piven workshop is the newest local program Citigroup has funded as part of its national Citi Salutes initiative to support veterans and military families. “After becoming familiar with the work of Piven Theatre Workshop’s programs for children, members of our Citi Salutes team saw an opportunity to provide these workshops for families and children involved in Kids Rank,” explains Marcia Saunders, head of Citigroup’s North America Service Initiative. For the pilot, Piven shaped a weeklong “workshop sampler” program for the kids, including many of the games and skill-set-building activities that would normally be featured in a six-week program. Some focused on community and family building, others on listening skills, and still others on taking risks and how to be present in the moment. Coming into the program, except for one set of siblings and another pair of friends, none of the children knew each other. And developmentally, they ranged from third grade through high school. But by the end? “They said they felt they had a new family,” says Humphrey. Piven has offered fall scholarships to every child that participated in the pilot workshop, part of the group’s ongoing commitment to inclusion and accessibility. And for its part, Citigroup will be supporting expansion of the Piven initiative—which will include adult programs to provide transitioning veterans with skills focus on career readiness and employment. For more information about Piven Theatre Workshop and this program, call 847-866-8049 or visit piventheatre.org.